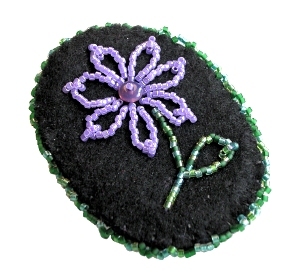 This brooch was originally beaded as a sample for my Bead Embroidery Class class. It uses chain stitch to form the flower petals and leaf, with back stitch for the stem. It was beaded on felt backed with interfacing and a beaded edging was added to finish.